The biterr function compares unsigned binary representations of elements in x with those in y. The schematics below illustrate how the shapes of x and y determine which elements biterr compares. Each element of x and y must be a nonnegative decimal integer; biterr converts each element into its natural unsigned binary representation. number is a scalar or vector that indicates the number of bits that differ. ratio is number divided by the total number of bits. The total number of bits, the size of number, and the elements that biterr compares are determined by the dimensions of x and y and by the optional parameters. If x and y are matrices of the same dimensions, then biterr compares x and y element by element. number is a scalar. See schematic (a) in the preceding figure. If one is a row (respectively, column) vector and the other is a two-dimensional matrix, then biterr compares the vector element by element with each row (resp., column) of the matrix. The length of the vector must equal the number of columns (resp., rows) in the matrix. number is a column (resp., row) vector whose mth entry indicates the number of bits that differ when comparing the vector with the mth row (resp., column) of the matrix. See schematics (b) and (c) in the figure. [number,ratio] = biterr(x,y,k) is the same as the first syntax, except that it considers each entry in x and y to have k bits. The total number of bits is k times the number of entries of the smaller of x and y. An error occurs if the binary representation of an element of x or y would require more than k digits. [number,ratio] = biterr(x,y,k,flg) is similar to the previous syntaxes, except that flg can override the defaults that govern which elements biterr compares and how biterr computes the outputs. The possible values of flg are 'row-wise', 'column-wise', and 'overall'. The table below describes the differences that result from various combinations of inputs. As always, ratio is number divided by the total number of bits. If you do not provide k as an input argument, the function defines it internally as the number of bits in the simplest binary representation of the largest among all elements of x and y. [number,ratio,individual] = biterr(...) returns a matrix individual whose dimensions are those of the larger of x and y. Each entry of individual corresponds to a comparison between a pair of elements of x and y, and specifies the number of bits by which the elements in the pair differ. Determine the number of bit errors. Determine the number of errors computed column-wise. Compute the number of row-wise errors. Compute the number of overall errors. This has the same behavior as the default. Demodulate a noisy 64-QAM signal and estimate the bit error rate (BER) for a range of Eb/No values. Compare the BER estimate to theoretical values. The while loop continues to process data until either 200 errors are encountered or 1e7 bits are transmitted. Determine the theoretical BER curve using berawgn. Plot the estimated and theoretical BER data. 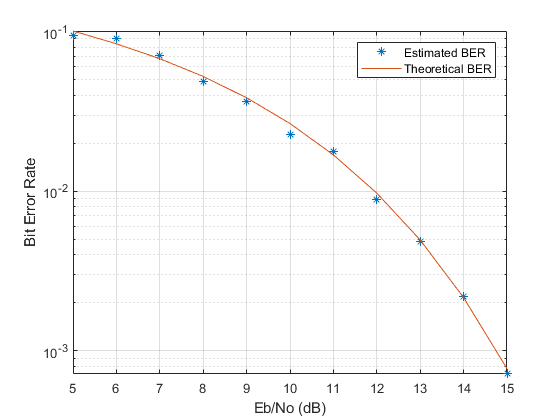 The estimated BER data points are well aligned with the theoretical curve.